Forget the cool morning breeze, when there’s a beach to explore nothing can stop us! 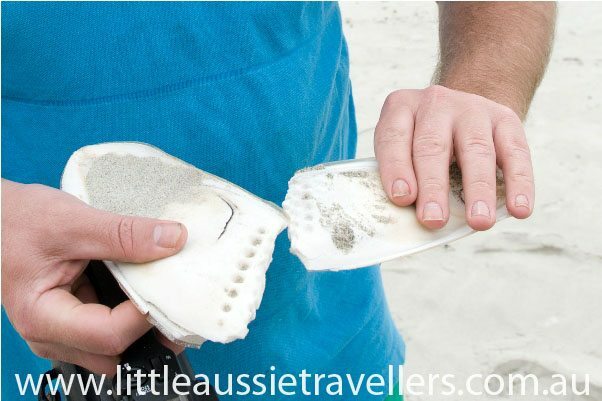 During our family holiday to Kangaroo Island we hit the shores of Vivonne Bay to see what we could find, and mother nature let us in on some great finds! Today for Wordless Wednesday I’m sharing a great one with you: a big cuttlefish bone with teeth marks in it! Can you see the teeth marks? DO YOU KNOW WHAT ANIMAL OWNS THESE TEETH MARKS? I’ll share the secret now 🙂 The bite marks are from a dolphin. We didn’t realise when we first found them, but a park ranger told us, it’s always interesting to find out things like that!